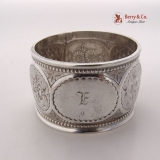 American sterling silver napkin ring with applied Palmette borders and no monograms by the Roger Williams Silver Company. c.1900. 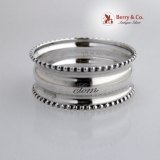 This elegant napkin ring is 1 3/4" in diameter, 1 1/2" tall and weighs 35 grams or 1.1 ozs. Troy. The soft, warm, original finish is present, with no buffing or machine polishing. The excellent original condition and clear, crisp detail, with no monograms, removals, repairs or alterations, make this an especially attractive offering. 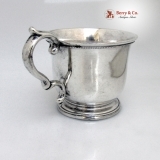 American sterling silver Aesthetic style child′s cup or mug by Gorham Silversmiths, date marked for 1878. This attractive cup has a body with Aesthetic geometric, foliate and bamboo engravings and a lower band of embossed Ivy vine decorations set on a stippled background with key work borders. The large, banded C shaped handle is in excellent condition. The front of the body has a diagonal inscription: Billie. Weighing 185 grams or 6 ozs. Troy, this special mug is 3 1/2" tall, 2 15/16" in diameter and 4 3/8" across the handle. Inscribed as described above, the soft, warm, original finish is present, with no buffing or machine polishing. The excellent original condition and clear detail, with no removals, repairs or alterations, make this an especially attractive offering. 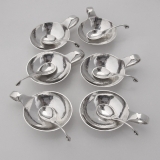 Danish sterling silver open salt dishes and matching spoons ,six sets, by Georg Jensen of Copenhagen, Denmark, c.1950. Each of these delightful dishes, pattern 667B, is 2" in diameter and 2 7/8" across the handle. The pattern 110 spoon is 1 1/4", with the total weight of the six dishes and six spoons being 230 grams or 7.4 ozs. Troy. The soft, warm, original finish is present, with no buffing or machine polishing. The excellent original condition and clear, crisp detail, with no monograms, removals, repairs or alterations, make this an especially attractive offering. Offered elsewhere for $250 each, our price of $191.66 each is as special as the salt dishes themselves. American coin silver calling card case likely by Leonard and Wilson of Philadelphia, c.1850. 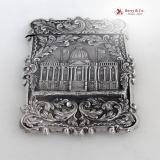 This fabulous case features high relief depictions of the US Capitol building on one side and George Washingtonâ€²s Tomb at Mt. Vernon on the other. The buildings are surrounded by foliate, floral, shell and scroll decorations, all set on a stippled background. Ths top opens, closes and fits properly and the hinge is clean and tight. The case is 3 1/2" - 2 1/2" and 1/2" thick, weighing 41 grams or 1.3 ozs. Troy. The excellent original condition and crisp detail, with no monograms, removals, repairs or alterations, make this an especially attractive offering. The soft, warm, original antique finish is present, with no buffing or machine polishing. American coin silver napkin ring with alternating engraved border oval panels of embossed floral and geometric decorations and applied beaded rims, monogrammed: E with a small 9 below, c.1850. This unusual, early coin silver napkin ring is 2" in diameter, 1 1/8" tall and weighs 26 grams. Monogrammed as described above, the soft, warm, original finish is present, with no buffing or machine polishing. The excellent original condition and clear detail, with no removals, repairs or alterations, make this an especially attractive offering. 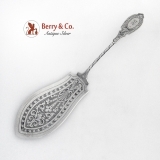 American sterling silver Arts and Crafts pie or pastry server in the Faneuil pattern by Tiffany and Company Silversmiths, c.1910. This large, handsome server has the script m mark, a serrated edge, is 11 1/4" long and weighs 146 grams or 4.7 ozs. Troy. The soft, warm, original finish is present, with no buffing or machine polishing. The excellent original condition and clear, crisp detail, with no monograms, removals, repairs or alterations, make this an especially attractive offering. Offered elsewhere for $495, our price of $395 is as special as the piece itself. American coin silver mug or cup with applied beaded borders and a rasised circular base by William Adams of New York City, c.1840. This special cup is inscribed, in period script: My Husband and has a reverse C scroll handle. Weighing 150 grams or 4.9 ozs. Troy, this delightful cup is 3" tall, 3 1/2" in diameter and 4 3/4" across the handle. Inscribed as described above, the soft, warm, original finish is present, with no buffing or machine polishing. The excellent original condition and clear detail, with no removals, repairs or alterations, make this an especially attractive offering. 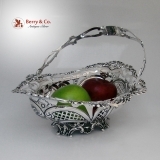 American sterling silver large basket by Gorham Silversmiths, date marked for 1907. This beautiful basket with a swing handle, open work decorations and applied scroll and shell boarder sits on an elegant ornate foot. Dimensions: 12 1/4" long, 9 1/2" wide, 9" tall, 3 1/2" deep and weighs a substantial 740 grams or 23.8 ozs Troy. The soft, warm, original finish is present, with no buffing or machine polishing. The excellent original condition and clear, crisp detail, with no monograms, removals, repairs or alterations, make this an especially attractive offering. 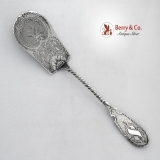 American coin silver pastry server retailed by Ball Black and Co. of New York City, likely made by J. R. Wendt, c.1860. 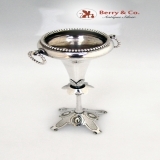 This ornate and finely detailed server has an engraved, bright cut, shaped twist handle and a rounded, raised edge, engraved rose and shell, bright cut blade and is 9 7/8" long, weighing 66 grams or 2.1 ozs. Troy. The soft, warm, original finish is present, with no buffing or machine polishing. The excellent original condition and clear, crisp detail, with no monograms, removals, repairs or alterations, make this an especially attractive offering. 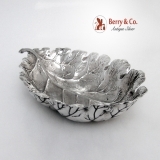 Italian sterling silver Oak Leaf dish by Buccellati Silversmiths, late 20th C. Buccellatiâ€²s exquisite dishes showcase the beauty and elegance of nature. Handcrafted from sterling silver in the shape of flowers, leaves and shells, they make lovely gifts that will become heirlooms. This lovely oak leaf dish is 5 5/8" long, 3 5/8" wide and weighs 69 grams or 2.2 ozs. Troy. The soft, warm, original finish is present, with no buffing or machine polishing. The excellent original condition and clear, crisp detail, with no monograms, removals, repairs or alterations, make this an especially attractive offering Offered elsewhere for $600, our price of $295 is as special as the piece itself. 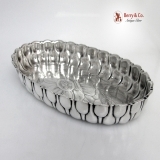 American sterling silver Aesthetic design Sweet Meat dish by the Whiting Manufacturing Company, c.1880. 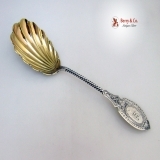 This special dish has allover acid etched flowers on the inside and an unusual scalloped edge, funnel shaped fluted gallery. It′s indescribably beautiful!. Well maybe not so much as the leg lamp in the movie A Christmas Story, Nonetheless, no one could argue that this isn′t one beautiful serving dish. It would also serve well as a dresser tray or even a calling card tray. Weighing 107 grams, this special dish is 7 1/4" long, 4 3/8" wide and 7/8" deep. The back of the dish has an ornate, period monogram: W Monogrammed as described above, the soft, warm, original finish is present, with no buffing or machine polishing. The excellent original condition and clear detail, with no removals, repairs or alterations, make this an especially attractive offering. 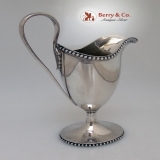 American sterling silver hand made and hammered double jigger by Porter Blanchard of Calabasas, California, c.1940. This handsome Arts and Crafts style jigger is 4" tall, 1 1/2" in diameter and weighs 66 grams or 2.1 ozs. Troy. The soft, warm, original finish is present, with no buffing or machine polishing. The excellent original condition and clear, crisp detail, with no monograms, removals, repairs or alterations, make this an especially attractive offering. 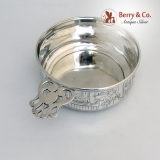 American sterling silver keyhole handle Peter Rabbit porringer or baby bowl by the Webster Company, c.1940. This attractive and useful porringer has allover school days scenes of Peter Rabbit, starting with his mom getting him ready for school, his journey to school, his late arrival, his run in with the teacher and his sitting on the punishment stool wearing the Dunce Cap. This special porringer is 4" in diameter, 5 1/2" across the handle, 1 1/2" deep and weighs 79 grams or 2.5 ozs. Troy. The soft, warm, original finish is present, with no buffing or machine polishing. The excellent original condition and clear, crisp detail, with no monograms, removals, repairs or alterations, make this an especially attractive offering. 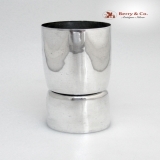 American sterling silver double jigger in an Art Moderne design by Allan Adler of Hollywood, California. 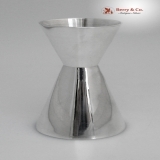 The superb Modernist design, hand made jigger is 3 5/8" tall, 2" in diameter and weighs 57 grams or 1.8 ozs. Troy. The soft, warm, original finish is present, with no buffing or machine polishing. The excellent original condition and clear, crisp detail, with no monograms, removals, repairs or alterations, make this an especially attractive offering. Available elsewhere for $389, our price of $295 is as special as the piece itself. 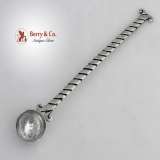 Mexican 990 sterling silver Arts and Crafts style small serving spoon in the Aztec pattern with a flattened twist handle by Hector Aguilar of Taxco, Mexico, c.1940. 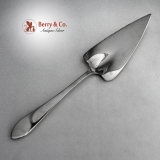 This special spoon would work well for mustard or relish and is 7 3/8" long, weighing 42 grams or 1.4 ozs. Troy. The soft, warm, original finish is present, with no buffing or machine polishing. The excellent original condition and clear, crisp detail, with no monograms, removals, repairs or alterations, make this an especially attractive offering. American sterling silver Repousse tea ball, pattern 439, by Gorham Silversmiths, date marked for 1880. 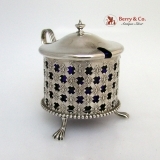 This exquisite tea ball is in pristine condition and is 1 7/8" in diameter and weighs 29 grams. The hinge is clean and tight, with the lid opening and closing properly. The soft, warm, original finish is present, with no buffing or machine polishing. The excellent original condition and clear, crisp detail, with no monograms, removals, repairs or alterations, make this an especially attractive offering. American sterling silver napkin ring by the Webster Company, c.1920. Inscribed Tom and T on the reverse side, this beaded border napkin ring is 1 7/8" in diameter, 3/4" tall and weighs 13 grams. Inscribed as described above, the soft, warm, original antique finish is present, with no buffing or machine polishing. The excellent original condition and clear, crisp detail, with no removals, repairs or alterations, make this an especially attractive offering. 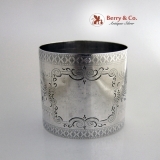 American sterling silver napkin ring in a Baroque style with applied fancy scroll borders by the Watson Company. c.1900. This elegant napkin ring is 1 3/4" in diameter, 1 1/4" tall and 26 grams. The soft, warm, original finish is present, with no buffing or machine polishing. The excellent original condition and clear, crisp detail, with no monograms, removals, repairs or alterations, make this an especially attractive offering. 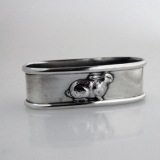 American sterling silver applied Bunny Rabbit napkin ring by Lunt Silversmiths, c.1940. This attractive child′s oval napkin ring is inscribed Jâ€¢Aâ€¢Yâ€¢ Jr. and is 2 3/8" long, 15/16" wide, 3/4" tall and weighs 20 grams. Inscribed as described above, the soft, warm, original finish is present, with no buffing or machine polishing. The excellent original condition and clear detail, with no removals, repairs or alterations, make this an especially attractive offering. 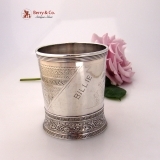 American coin silver Aesthetic engraved large napkin ring, c.1875. 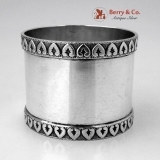 This attractive napkin ring is 1 7/8" in diameter, 2" tall and weighs 40 grams or 1.3 ozs. Troy. The soft, warm, original finish is present, with no buffing or machine polishing. The excellent original condition and clear, crisp detail, with no monograms, removals, repairs or alterations, make this an especially attractive offering. American sterling silver napkin ring, pattern b1975 by Gorham Silversmiths, c.1900. 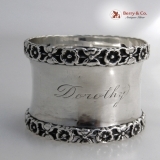 This elegant napkin ring, inscribed, in period script: Dorothy, has applied Pansy borders and is 1 7/8" in diameter, 1 1/2" tall and weighs 30 grams. 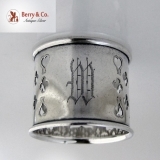 Showing normal use marks on the inside of the ring, this special napkin ring is inscribed as described above. The soft, warm, original finish is present, with no buffing or machine polishing. The excellent original condition and clear detail, with no removals, repairs or alterations, make this an especially attractive offering. 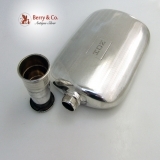 American sterling silver Art Deco large hip flask by Napier, c.1930. This 10 oz. capacity flask has a collapsible cup for a cap and has line decorations on the body. The rectangular cartouche has the block letter monogram: H O M and, on the opposite side is inscribed: TEA FOR TWO.. Weighing 248 grams or 8 ozs. Troy, this superb flask, curved to fit the body, is 6 3/4" tall, 4" wide and 7/8" thick. Monogrammed and inscribed as described above, the soft, warm, original finish is present, with no buffing or machine polishing. The excellent original condition and clear detail, with no removals, repairs or alterations, make this an especially attractive offering. Portuguese sterling silver large figural toothpick holders, Oporto, c.1980. This nice set consists of a young boy with a basket on his back and a girl holding a parasol upside down. They are both in period costume and and sit on matching lions paw and shell feet circular ornate pedestal bases, marked with the Convention sterling mark for Oporto, Portugal and the makerâ€²s mark. 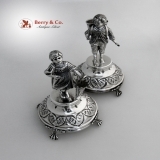 These very well made and nicely detailed reproductions of early 19th Century styled toothpick holders are very nice sterling silver representations of forms that would be worth $1000s if they were period. This is a good opportunity to get the look, substance and feel at a fraction of the price. Weighing a total of 432 grams or 13.9 ozs. Troy, each statue is about 6 1/2" tall, with the boy being slightly taller. The soft, warm, original finish is present, with no buffing or machine polishing. The excellent original condition and clear, crisp detail, with no monograms, removals, repairs or alterations, make this an especially attractive offering. The price is for both. American coin silver bud vase in the Aesthetic taste, c.1875. This most unusual vase has an applied beaded rim and beaded ring handles. The middle of the stem has a Lotus leaf collar and a small beaded ring below, sitting on a oval medallion stippled footed base. Weighing 122 grams or 3.9 ozs. Troy, this special vase is 7 7/8" tall ans 2 1/8" in diameter. The vase is unmarked but guaranteed to be as represented. The soft, warm, original finish is present, with no buffing or machine polishing. The excellent original condition and clear, crisp detail, with no monograms, removals, repairs or alterations, make this an especially attractive offering. 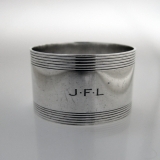 American sterling silver napkin ring in an Art Deco design by Tiffany and Company, c.1935. This handsome napkin ring is 1 7/8" in diameter, 1 1/2" tall and weighs 54 grams or 1,7 ozs. Troy. Monogrammed as described above, the soft, warm, original finish is present, with no buffing or machine polishing. The excellent original condition and clear detail, with no removals, repairs or alterations, make this an especially attractive offering.